Our latest Housatonic Recommended Mating features the recent acquisition Intrepid Forest, a seven-time sprint winner by top sprinter Forestry, who visits Bernardini’s very fast son Buffum at Northview this spring for her maiden mating. 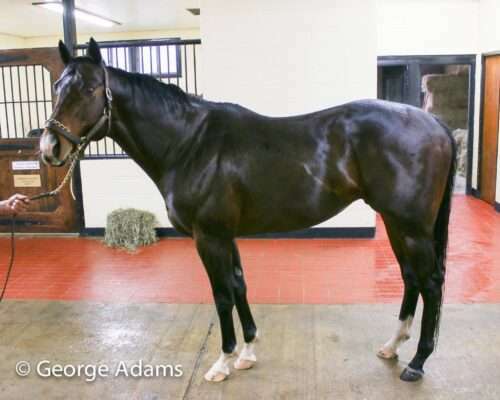 Buffum was a $1.2 million yearling who debuted at 2-years-old with a win at one mile, but his biggest career victory came at 4-years-old in the Grade 3 Bold Ruler Handicap, in which he covered 7 furlongs wire-to-wire in 1:21.68. He was described by trainer Tom Albertrani as the fastest Bernardini he ever trained, and he had many of them given his status as a trainer for Godolphin, who stands Bernardini and raced Buffum. And Buffum is also built a bit on the downhill, with a very large hind-end — though he is a bit leggier than some sprinters. Buffum is off to a very strong start at stud, despite limited opportunities — his first foals were 3-year-olds of 2018, and while he only has 15 named foals between his first two crops, two of them are stakes winners (good for 13%) and another is black-type placed, among the nine winners from eleven Buffum offspring to reach the races — huge percentages from a statistically small sample. Still, from just a 1.09 CI for the mares he bred, he has achieved a 1.75 AEI, meaning he’s moving his mares up quite a bit. His biggest winner so far is Clever Mind, who broke his maiden first-time out in the Maryland Million Nursery over more experienced rivals for trainer Graham Motion. Clever Mind was a $100,000 RNA as a sales yearling, highlighting the surprisingly strong commercial results that Buffum’s foals have achieved so far. From his first crop, along with Clever Mind, Buffum had an $85,000 sale yearling, and he also had a $25,000 yearling this past October from his third crop, off of just a $2,500 advertised stud fee — so his foals have looked the part. As mentioned above, Intrepid Forest is a daughter of Forestry, and the nick for this match is an “A++” because Bernardini and his sons, when mated with daughters of Forestry, have produced 25 foals of racing age, of which 15 have won, and four are stakes winners (good for 16% of the foals bred on the cross), including the Grade 3-winning sprinter Sassicaia. Since Forestry is a son of Storm Cat and Buffum’s dam is a Storm Cat mare, the foal from this mating will be inbred 3×3 to that former Overbrook superstar — but even though, anecdotally, inbreeding to Storm Cat so closely is thought of as a negative given his propensity for passing on offset knees, 3×3 inbreeding to Storm Cat has actually produced 2.2% stakes winners to foals (compared to the 2.4% breed average). And the statistics for 3×3 inbreeding to Storm Cat are even better when you look specifically at the results for runners sired by A.P. Indy grandsons who happen to be out mares by Storm Cat, as such stallions have thrown seven stakes winners from 108 foals bred this way, good for 6.5% (including a pair of Grade 3 winners). Although Buffum does not yet have any foals from Storm Cat-line mares, both he and Intrepid Forest are correct through their own knees, so we are not overly concerned about the inbreeding pattern in this case. Additionally, Intrepid Forest is a half-sister to the two-time winner of $70,848 Stormin Hongkong, by Buffum, and their half-sister Intrepid Tour has produced the winner Starting Tour, by Buffum. Plus Touring Hong Kong, the stakes-placed half-sibling to Intrepid Forest, has a yearling colt by Buffum who could add to the success of this cross next year. Physically, Buffum and Intrepid Forest make a nice pairing as well, given that both are solidly-made, well-balanced horses with plenty of height and leg.